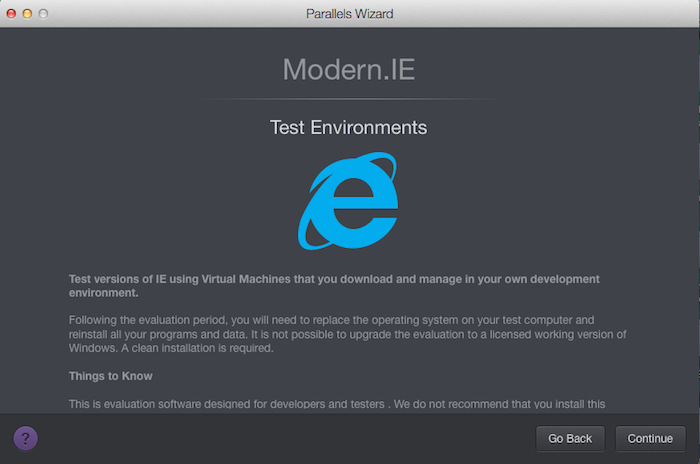 Modern.IE Test Environments are 90-day pre-configured test Windows virtual machines specially created for software developers and testers. This KB describes how to download and use these virtual machines. This is evaluation software designed for developers and testers . We do not recommend that you install this evaluation if you are not a developer or tester. Unfortunately, as of now, there is no way to convert these Windows trial virtual machines to a non-expiring virtual machine. When the 90 days trial expires, your Windows virtual machine will stop working. There will be no option to re-activate it even using a commercial Windows key. You will lose access to your Windows applications and there will be no way to migrate it to another Windows virtual machine. Regrettably, you will not be able to upgrade from Modern.IE Test Environment. 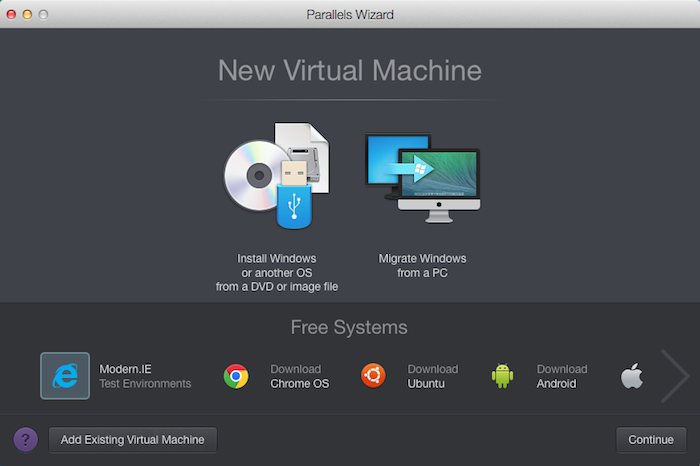 Start Parallels Desktop for Mac and click File > New in the menubar. 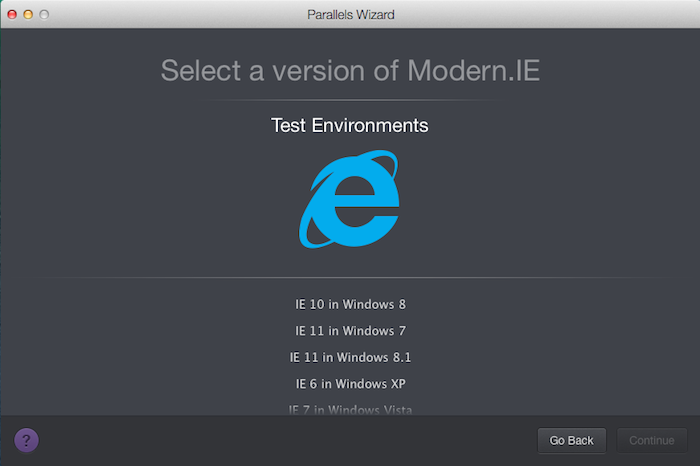 Choose Modern.IE Test Environment from the New Virtual Machine Wizard and click Continue. NOTE: In case you are unable to view Modern.IE icon please check your internet connection. Your Mac must be connected to the internet. 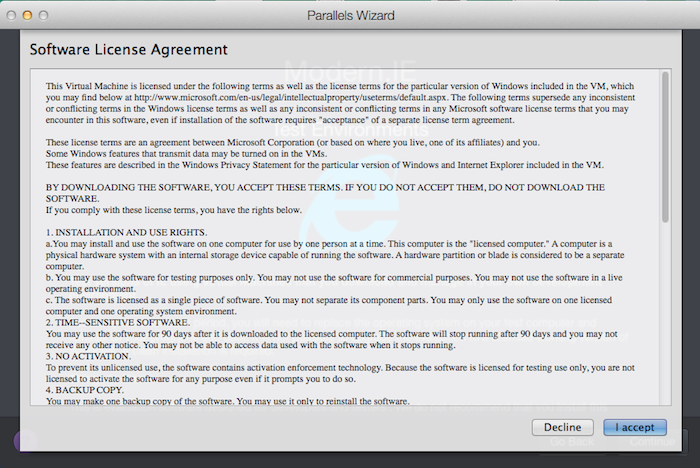 Read the information about the Modern.IE Test Environment and accept the Software License Agreement. Choose the installation image from the list. Your Windows Modern.IE Test Environment virtual machine is ready for downloading! 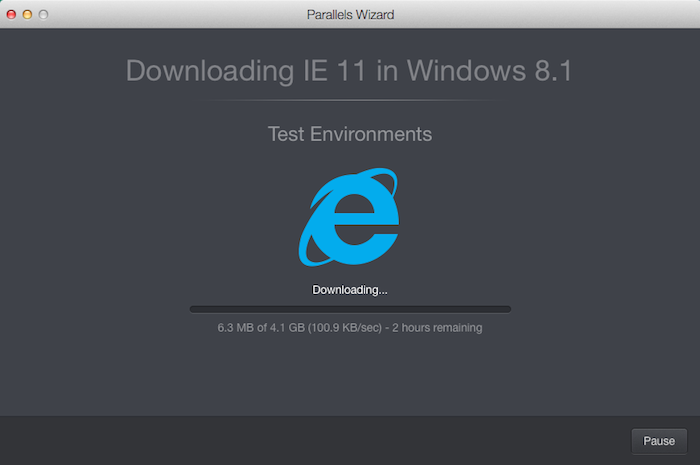 You can watch the downloading progress from the Parallels Wizard or from the Parallels Control Center. Once Windows Modern.IE Test Environment is installed, launch the virtual machine.